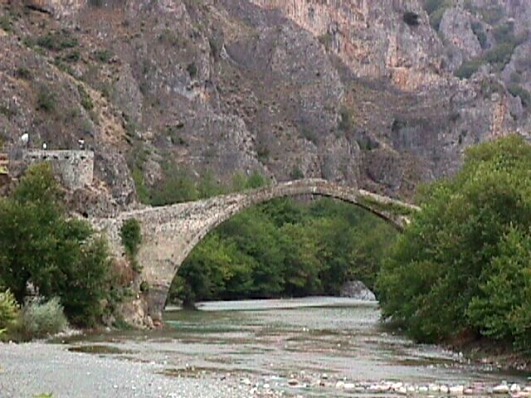 Near Konitsa, at the exit of Aoos river, is located the arch stone-built bridge which is one of the biggest bridges in Greece. It has an altitude of 20 metres and length 40 metres. It was built in 1870 by the builder Ziogas Frontzos from Pyrsogianni and with the financement of the banker I. Loulis from Katsanochoria. Its construction ended in 1871 and cost about 120.000 turkish coins. The former wooden constructions of 1823 and after were drifted by the river. It is remarkable the faxct that its builder Ziogas Frontzos was an illiterate and simple craftsman. This bridge is indeed a work of art and beauty, excellent constructed and incomprarable to the other tradiotional bridges of the same period. The bridges was recontrructed in 1913 because Tzavit Passas destroyed it when he left the region. Its bell which hung under its arch, so as to warn the passengers when the string wind blew (it was like a warning bell), was lost during the old years and was replaced by another one in 1975. 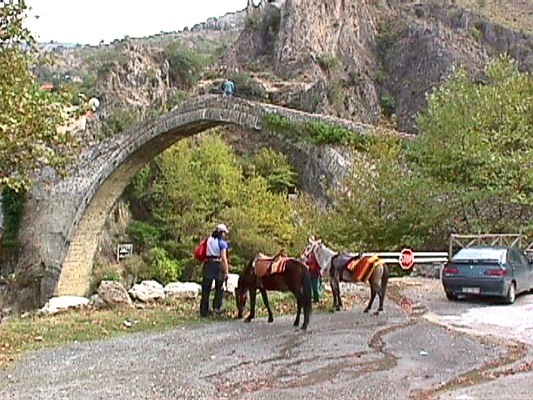 Under the bridge and at its rights side, there is a beautiful path leading to the monastery of Stomio.